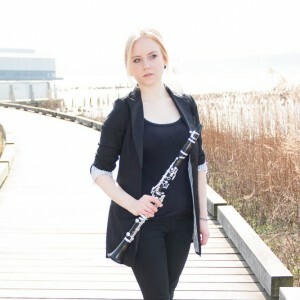 Praised for her “incisive” playing by the New York Times, clarinetist Anna Brumbaugh is an active orchestral player and chamber musician. Currently principal clarinet of the Florida Grand Opera and the Palm Beach Symphony and with Miami’s Nu Deco Ensemble, she has also performed professionally with the American Ballet Theatre Orchestra, The American Symphony Orchestra, The Orchestra of St. Luke’s, The Colorado Music Festival Orchestra, and the Lakes Area Chamber Music Festival in Brainerd, MN. Ms. Brumbaugh earned her Master of Music degree from The Juilliard School in May of 2013. She was awarded her Bachelor of Music with High Distinction and Performer’s Certificate from the Eastman School of Music in 2011. Her major teachers have included Jon Manasse, internationally acclaimed soloist, and Bil Jackson, former principal clarinet of the Colorado Symphony. An avid educator, Ms. Brumbaugh teaches clarinet at the New World School of the Arts and Miami Arts Charter School.